This salad highlights and celebrates celery, which is often enjoyed in salads, but usually not as the main ingredient or flavor. 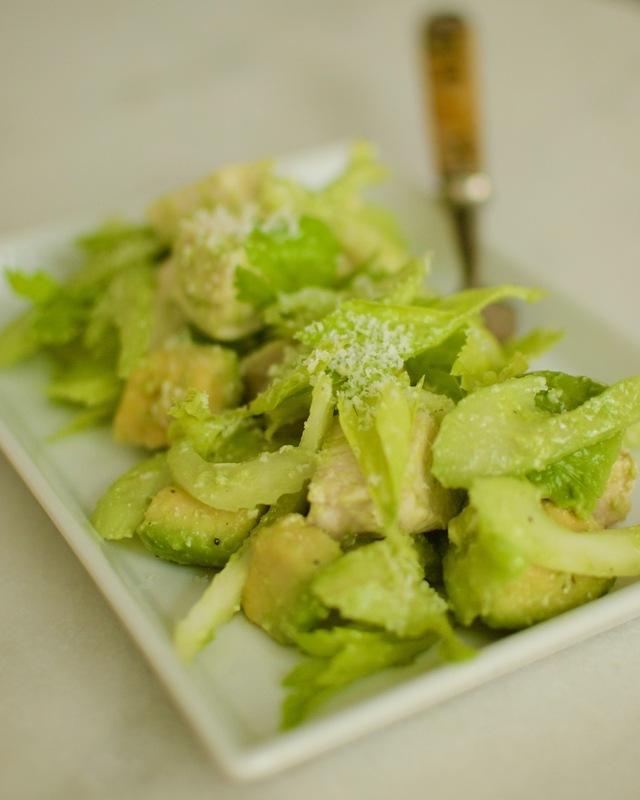 I love the crunch of the celery against the creamy-richness of the avocado, velvety texture of poached chicken and sharpness of the lemon and Parmesan. You should certainly use leftover chicken breast for this if you have it on hand, which I’ve done. But luckily, poaching a chicken breast for the salad takes no time at all. You can poach the chicken while the salad is in the fridge and add it once the chicken has been cooked and cooled. 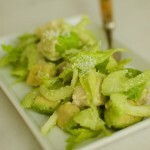 This is a great side salad to have with a sandwich for lunch or can be a great lunch for two on its own. Of course, omit the chicken if you wish to make this vegetarian. Whisk together the olive oil, lemon juice, salt and pepper into a medium-sized mixing bowl. Next, add the avocado and gently stir, covering all sides of the avocado with the lemon dressing to keep it from turning brown. Then add the celery, chicken and 1 ounce the Parmesan. Stir gently. Cover and refrigerate for about an hour, allowing the flavors to marry. Serve chilled with an extra sprinkling of Parmesan. Don’t bother with that pre-grated cheeses you would find on market shelves. Instead, check your deli counter for freshly grated Parmesan. Alternatively, you can, of course, grate your Parmesan yourself using the small side of a box grater, or toss the cheese, cut into chunks, into a food processor and process until grated.